I'm so glad that you stopped by today! 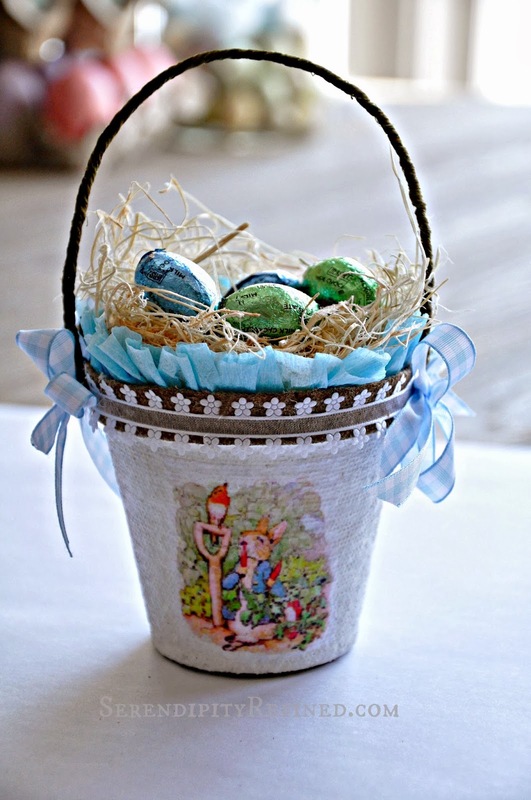 We're going to have our first day in the 50's today and I'm sharing an easy DIY Spring Craft: Easter Bunny Egg Baskets made from simple peat pots and decorated with images of Peter Rabbit...and a few scraps of ribbon and paper! I have been waiting patiently for Spring to arrive for the last week month and since I had a few peat pots left over after starting my flower and vegetable seeds, I decided to decorate a few of them to use in a spring tablescape. Of course I realize that spring is still a month away here in Illinois but they're forecasting temperatures in the 40's and 50's this week and my thoughts have turned to sunshine, fresh air, and, Peter Rabbit! The peat pots that I used are four inches across. I purchased mine at a local garden center for about thirty cents each. 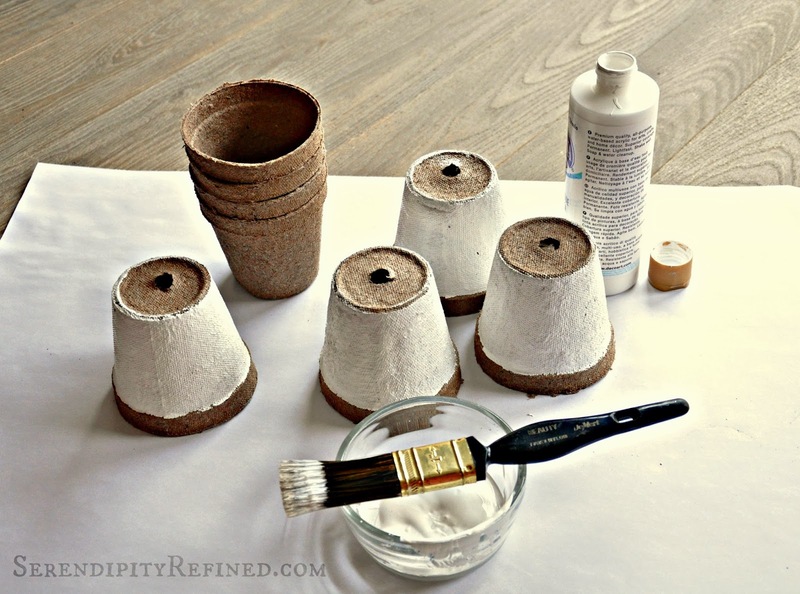 First, paint the bottoms of the pots with a heavy layer of white craft paint starting just below the rim. Next, find an image that you want to use on the Internet (I searched "Peter Rabbit" in Google image). I opened it in a word document, sized the image to about 2.5 inches and duplicated it several times on the page. Then, I printed it onto white tissue paper by cutting a piece of tissue that was slightly larger than an 8.5 by 11 inch inch sheet of paper and taping the top edge to a piece of card stock and feeding it into my printer. Cut the images apart leaving about 3/8 of an inch all the way around. 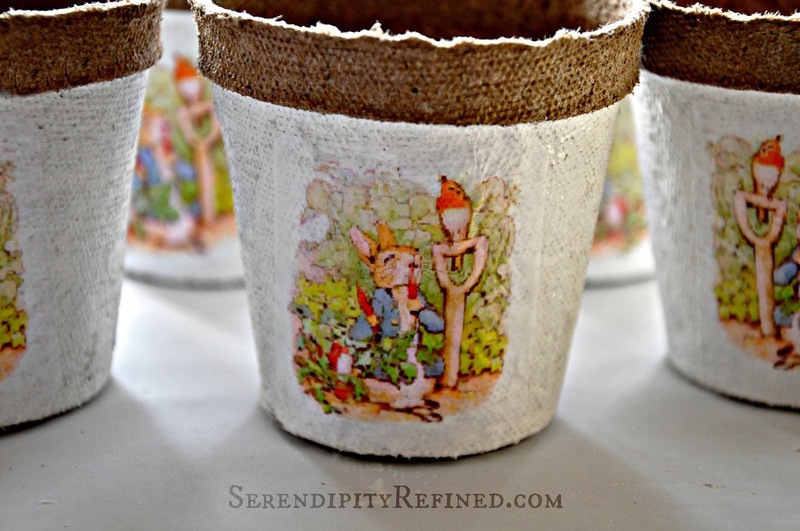 Apply Mod Podge to the side of the pot covering an area slightly larger than the tissue would cover. 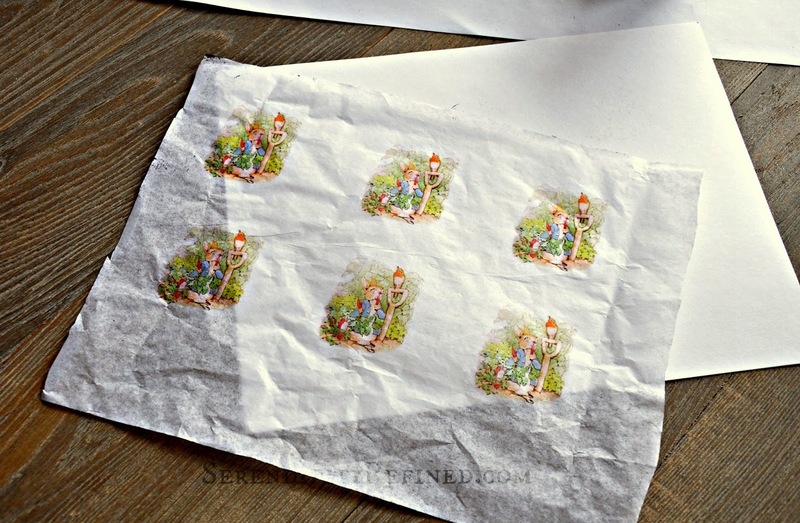 Carefully apply the tissue to the Mod Podge and tap it gently to straighten it and to make sure that it is adhered. 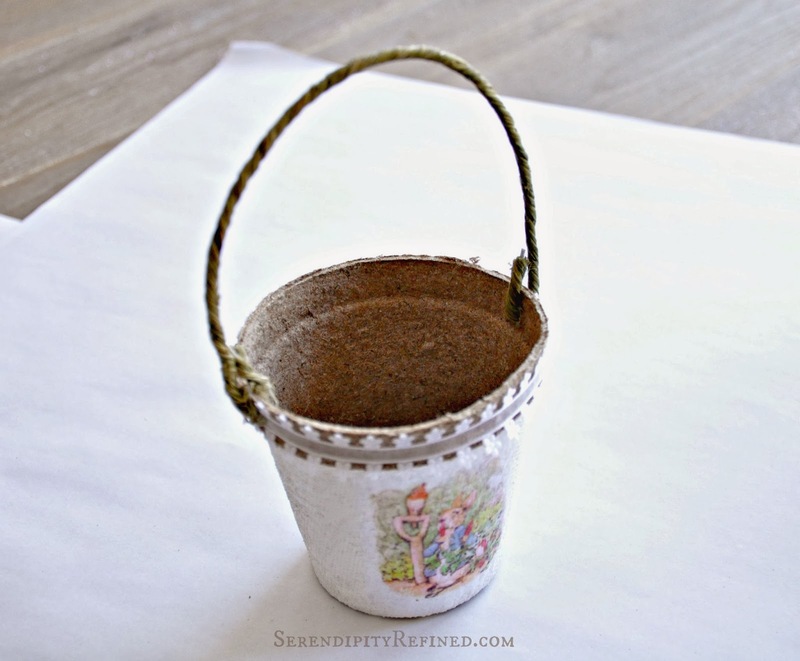 After it dries, apply a second coat of Mod Podge to seal the image and blend the tissue into the side of the pot. Wrap a piece of ribbon around the rim of the pot and hot glue it into place. Then, using a skewer or the tip of your scissors, poke a hole through the ribbon and the side of the pot to attach the handle which is formed from a seven inch piece of jute covered wire that I found at the craft store. Simply push one end of the handle through each side of the pot and form a loop to keep the handle in place. I made the little ruffle that peeks out of the top edge using about a yard of crepe paper that I had on hand. 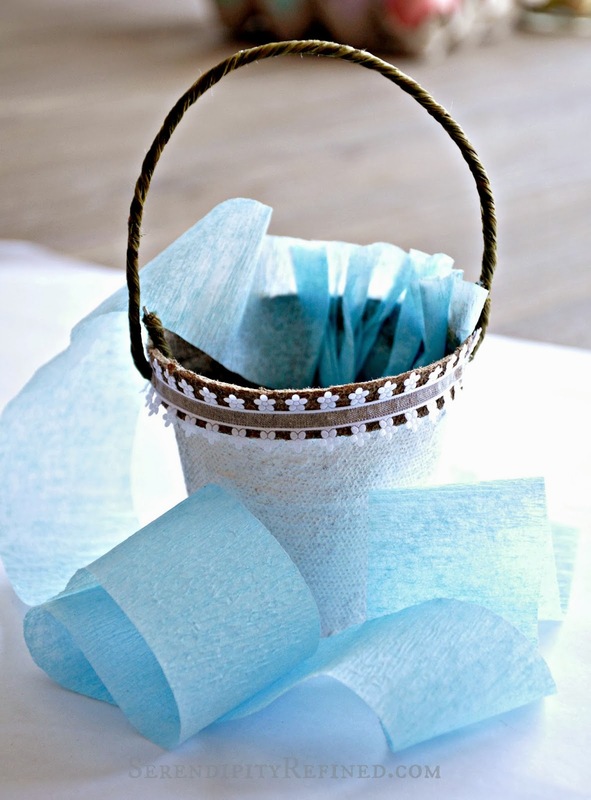 Simply run a line of hot glue inside the rim of the pot then push the crepe paper into the glue and scrunch it to form the "ruffle". Then, I added a couple of gingham bows on the sides to cover the holes where the handle attaches. 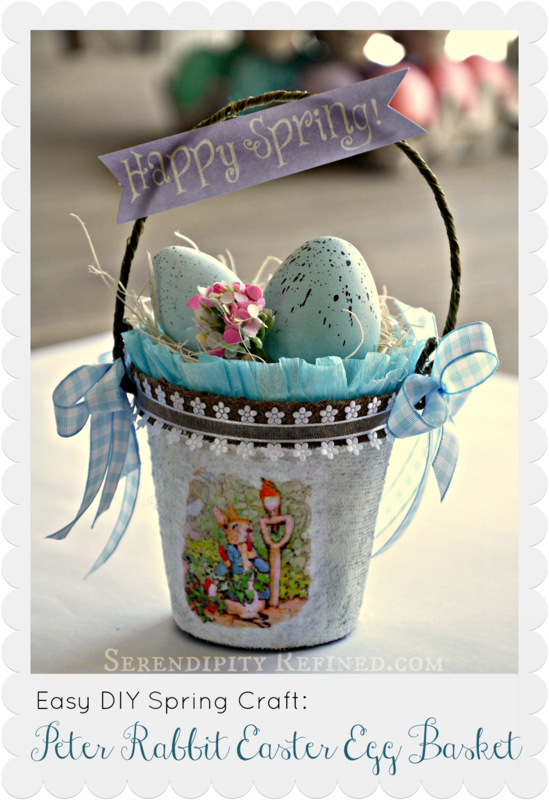 a couple of faux eggs and a spring flower or two.... even some little signs. 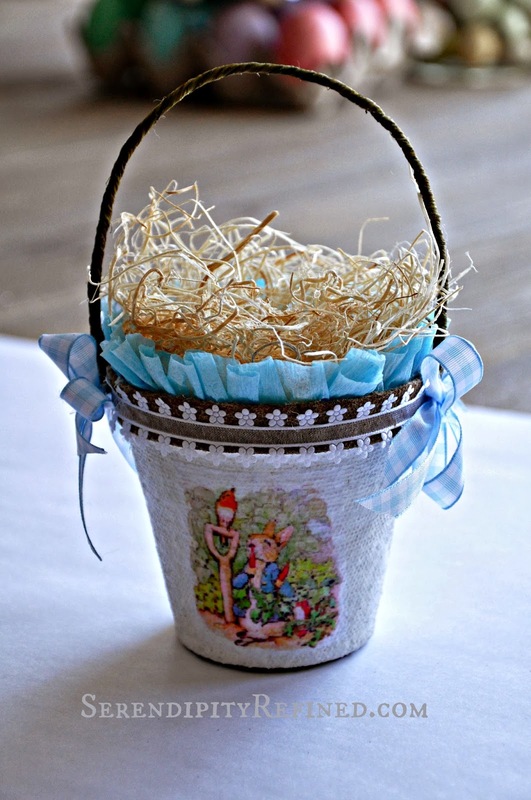 I'm going to use these Peter Rabbit decorated egg baskets as a part of my Easter tablescape but I've decided that they'd also make adorable baby shower favors or cute May baskets! 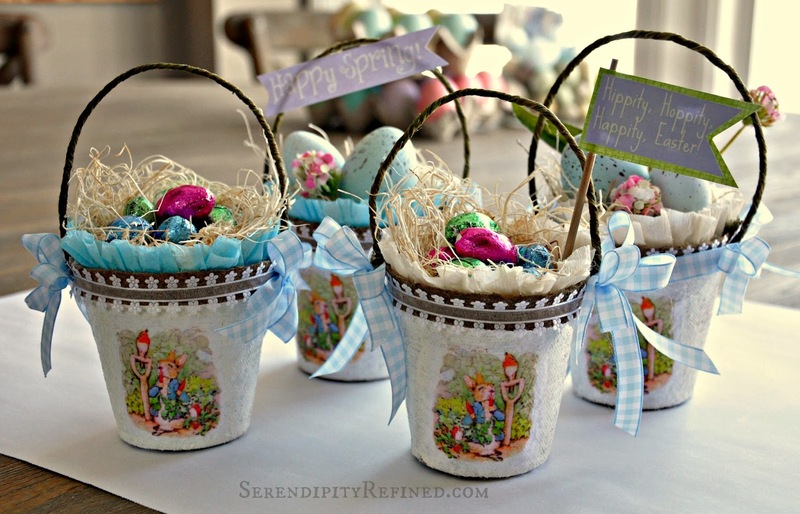 I'm not certain what I'll end up filling them with on Easter morning, but I'm excited at how inexpensive and easy it was make this DIY Easter craft using scraps of ribbon and peat pots that I already had on hand. I hope that you'll make a few for yourself!